Through out the years, I have accumulated a large collection of fireplace pictures. These are very handy in creating your own fireplace design, its surround, mantle and even bookcases/cabinetry. All various types of fireplaces are represented in these pictures. Both of the above pictures are prefabricated gas fireplaces, cannot be use for wood burning. The fireplace is ventless gas logs, (no chimney) with built-in bookcases on both sides. The left fireplace is ventless gas logs and the right fireplace is a vented gas log fireplace. The above is a masonry wood burning fireplace with built-in bookcases. 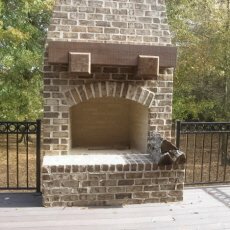 The left is an outdoor masonry fireplace located on a deck next to the porch and the right is a prefabricated fireplace with gas logs installed. This is a masonry wood burning fireplace with gas logs installed and built-in bookcases/cabinetry. The left fireplace is a direct-vent gas fireplace and the right is an electric fireplace.